On Boxing Day, it is traditional to give gifts to those who are below you. I must be below EVERYONE. Q. Have you heard that the PLO has taken fifty violists hostage? Makes about as much sense as it doesn’t, no? That’s right! It’s a beanie with headphones built right in. You could walk to the Metro to Mussourgsky — ski to Stravinsky — hike to… to… all right, to Handel (I was trying to think of a Russian ‘H’ but nothing comes immediately to mind). Even when the temperatures are down in the teens, you won’t suffer from what I like to call throbby ear. It hooks up to pretty much any MP3 player or cell phone, and it comes in black or yellow, too. It’s currently on sale at Urban Outfitters for fifty bucks; UO has store locations, too, if you find yourself cutting it really close. Good luck with parking! 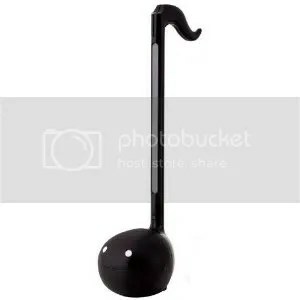 Well, it’s a synthesizer shaped like a music note, and it’s called an Otamatone. You select a note with the stem (perfect pitch is an asset here), and then for vibrato or the equivalent of a whammy pedal you squeeze the cheeks. That’s what the face is for, you see, so that the instructions can use the phrase “squeeze the cheeks.” This is a good present for a significant other therefore. I mean, what? See? You walk in the door, hand her this, hustle her into the kitchen, and insist she fill and freeze them immediately. Instead of water you could use juice! Or vodka! And then everyone’s drink… is slowly diluted. And possibly now alcoholic if it wasn’t before. Okay, so maybe not so much on the juice and vodka, depending. Maybe add some drops of food dye. That would be nifty. 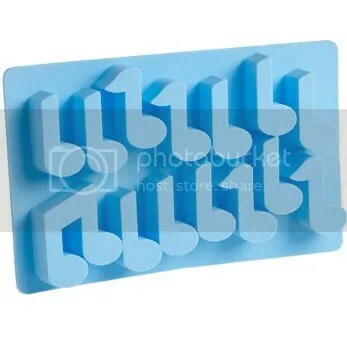 The point is, everyone would have ice cubes made of music! I’m sure there are various incarnations of these floating around the internet, but I found these at ModCloth for about ten bucks. Zero days till Beethoven’s birthday! That’s right, we’re holding it down for Schroeder. Today is Beethoven‘s birthday. If only he had the advantage of modern medicine, he would’ve been 241 today. You know it. I posted both to Twitter and Facebook last night about the impending date to give people time to prepare. I got some excellent and highly amusing responses as to the proper celebration — including decomposition and drinking a Fifth — but my favorite came from my friend Daniel: “Oh yeah, I’m getting him a sweet pair of noise cancelling headpho… Oh.” I very much enjoyed that. Q. Why did Beethoven get rid of his chickens? 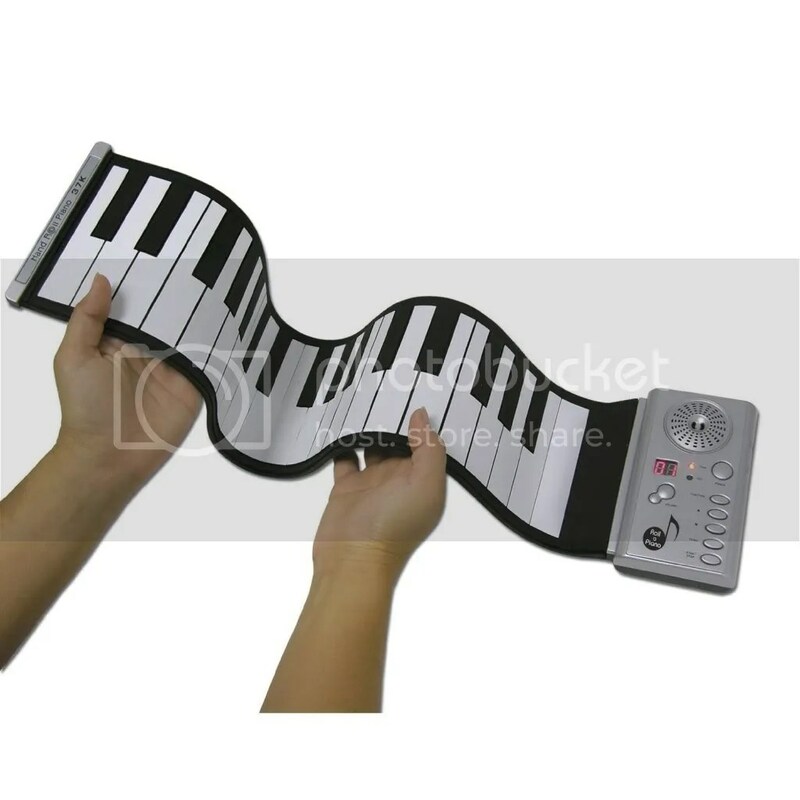 This particular music present is good for piano students, but awesome for anyone with a wonky sense of humor like me: a roll-up portable keyboard. No, no, that’s not Photoshop! It’s just crazy awesome. It’s a fully functional electric keyboard with three octaves worth of keys, a speaker, volume control, and you can ROLL IT UP INTO A BALL. I don’t even play the piano and I’m envious. Can someone PLEASE invent a roll-up cello? If you do have a pianist on your list (or maybe a composer? Good for on-the-go bursts of inspiration), you can get it at Amazon for a little under $40. Now that I am no longer at the mercy of the cancellations of school officials, I am of the opinion that there are two really good kinds of snow: the extremely heavy frosting kind where everything is buried by a good foot or more and EVERYTHING is closed and the whole area can go right back to bed; and the powdered sugar kind, where everything is just dusted enough that you can easily get to work but there’s a persistent smile on your face because it clearly snowed. Right now I am enjoying the latter, and since I am in such a good mood (so far) and I’m always happy to indulge in the holiday spirit, I’d like to tell you about something else that pleases me illogically: the brass section. I say “illogically” because I have been a loyal strings musician since the fourth grade. String instruments are naturally lyrical, expressive, and versatile. They are the backbone of an orchestra, the core from which everything else builds out. And yet a few nights ago I was listening to the WETA classical music station and the deejay played a brass ensemble’s recording of “Deck the Halls.” I loved the warm, mellow, but also somehow sharp sound of it, and it occurred to me: I am a sucker for horns. Examples: Rimsky-Korsakov’s “Procession of the Nobles.” The glorious, rising and rising finale of Respighi’s The Pines of Rome. Seasonally appropriate: “Chocolate” from Tchaikovsky’s The Nutcracker. “Bugler’s Dream.” That frickin’ AMAZING series of just six notes, repeated twice in harmony by two horns, at the end of the last movement of Beethoven’s seventh symphony — I kid you not, I have on more than one occasion rewound and played back those fifteen or twenty seconds just to hear the horn measures again. Love. I don’t know why. Do you? Which other horn-tastic pieces was I trying to think of but couldn’t just now? And do you harbor illogical love for an instrument? * Alternate titles: “Getting down to brass tacks,” “Me so horny,” “Handful of brass,” any number of puns along those lines. Feel free to insert your own.